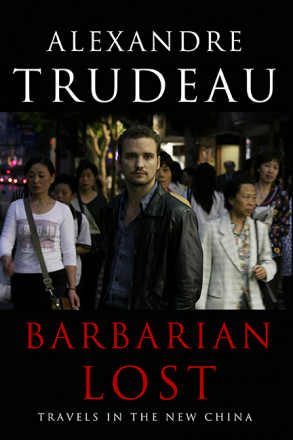 Join us on Wednesday, October 19th for the launch of Barbarian Lost: the moving debut book by traveller, filmmaker and journalist Alexandre Trudeau at the Westmount Library! Barbarian Lost is an insightful and witty account of the dynamic changes going on right now in China, as well as a look back into the deeper history of this highly codified society. On the ground with the women and men who make China tick, Trudeau shines new light on the country as only a traveller with his storytelling abilities could. **The event will be 5$ for regular entry, and 3$ for seniors. Tickets available in store, online or at the Westmount Library. Over the past decade and a half, his films and reports on issues of geopolitical importance have been seen and read by millions of Canadians. He charted out the intimate realities on both sides of the Israeli security barrier, explored the pluralism of Canadian identity, stood up for the rights of arbitrarily imprisoned terror suspects in Canada, tracked youth-driven democratic awakenings in the Balkans, shed light on the origins of unrest in Darfur, Liberia and Haiti and deconstructed the Canadian peace-keeping legacy fifty years after Pearson's Nobel. Born into one of the country's most prominent political families, Alexandre has been familiar to Canadians since birth by his nickname, Sacha. Trudeau lives in Montreal with his wife and three young children.